I find it surprising, almost shocking, that many entrepreneurs I meet have very little understanding of how the economy works. As a consequence, very few entrepreneurs I know understand how to gauge the economy and forecast what it might look like 6 months from now. You would think entrepreneurs should pay close attention to important economic bellwethers in order to strategically plan for the future. Unfortunately, most just rely on the headlines (which is reactive, not proactive) to learn about the economy. In light of that, I want to share with you 5 key economic indicators every entrepreneur needs to pay attention to. These economic indicators not only diagnose the current health of the economy, but they serve as great forecasters for business activity 3 to 6 months down the road. Knowing what these indicators are, and how to use the information they provide to your advantage, will help with business planning and strategic initiatives. BDI, Also known as the Dry Bulk Index, tells us how much raw, pre-production material is being shipped around the world. The BDI is viewed by most economists as one of the leading economic indicators because it provides a glimpse into manufacturing output, inventory levels and global trade. Changes in the BDI foreshadow economic activity two to four months down the road. Click here to read my in-depth report on the Baltic Dry Index. Copper is known as ‘Dr. Copper’ in the investment world because its price is believed to directly reflect the health of the global economy. The reason for that is quite simple. Copper is used in virtually all infrastructure projects around the world. Whether you’re building a house, new neighborhood, skyscraper, factory, or roads, copper is needed. As such, its price, obviously a reflection of supply and demand, tells us a lot about global economic activity. As a reference, for the last decade the average price of copper has been roughly US$2.75 per pound. Its high during that period was approximately $4.50 and its low around $1.40 (during the 08/09 recession). Today it sits at $3.05 per pound, slightly above the 10-year average. The Russell 2000 Index is particularly important for those entrepreneurs operating a retail business. You see, the Russell 2000 measures the performance of the small-cap market in the United States. The small-cap market is the first to crash before a recession and typically the first to rise before economic expansion. Additionally, it directly reflects investors’ risk tolerance. If the index is low, you know that investors have tightened their purse strings, likely not spending money on the ‘extras’ and certainly foregoing large purchases such as cars, luxury items and homes. If the index is high, then you know risk tolerance is up and investors likely have more disposable income than historical norms, which is great for retailers. This is a direct indicator of whether or not people are spending or hoarding cash. Since the Great Recession, Money Velocity has remained at, or near, all-time lows. This means people are uncertain about the future. Essentially, what Money Velocity measures is the rate at which money is exchanged during a specified period of time. So, in layman terms, it tracks how many hands touch one dollar during a period. The more hands which touch that dollar, the more robust the economy is. Typically, Money Velocity is measured in quarters (every 3 months). Money Velocity of 2 is considered good. The higher the Money Velocity, the more transactions there are occurring in the economy, which is obviously good for business. 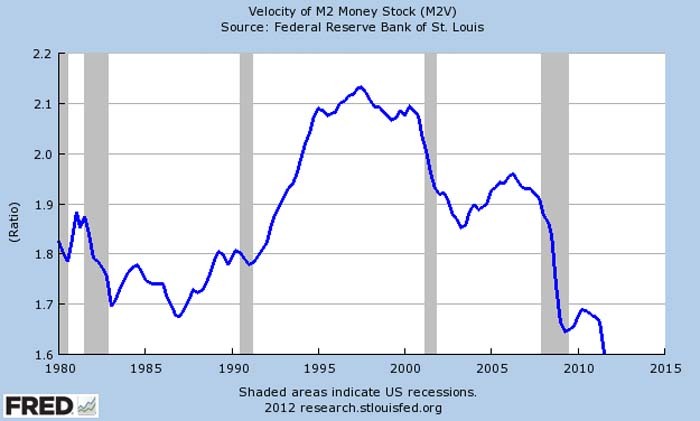 In Q2 of 2014, Money Velocity (M2) was 1.5. Lastly, a higher rate of Money Velocity often leads to increasing asset values because inflation rates rise with it. You can’t just look at one of these barometers; you must look at them both together. The unemployment rate measures the amount of people between 16 and 65 who are actively looking for a job, but do not have one. This is a great stat to know, but the problem with it is it does not include the amount of people who have given up looking for a job because the prospects of finding one are grim. That’s why you must look at the unemployment rate in conjunction with the labor force participation rate. Recently, the unemployment rate in the US has been dropping at an impressive clip. Over the last six years it has dropped from roughly 10% to around 6.1%. However, that stat on its own is misleading. The labor force participation rate is near 40 year lows. That’s bad. This is due to the fact that millions of people have given up hope looking for a job in their field because the prospects are so low. These people have opted for early retirement, gone back to school or, unfortunately, completely given up and are collecting welfare. By them dropping out of the workforce, they are helping drive the unemployment rate lower. Bear in mind, these indicators are considered to be lagging. That means they give you a snapshot of what’s happening right now. For both barometers, you want to look for the trend over the last 24 months to truly understand where the economy is headed. If the labor force participation rate is high and unemployment low, and the trend has been that way for a while, you know we are in a booming economy and you can afford to take more risk (expand your business). There you have it. These 5 key economic indicators are vital in helping entrepreneurs properly plan their business strategies for the future. Pay close attention to these indicators when running your venture and be sure to use them in an all inclusive manner. To understand the totality of the economic environment, and where it’s headed, you can’t cherry pick one or two of these indicators; you must review them all. Knowledge leads to profits.